We are instrumental in bringing for the clients superior quality traditional Thewa Jewellery which is highly appreciated for its authenticity and fine finish. 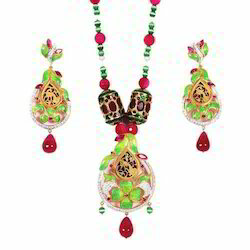 Range of traditional Thewa Jewellery is a popular piece of fashion Jewellery . The brand of genuine traditional Thewa Jewellery is a depiction of artistry achieved in the production of Handmade Traditional Indian Jewellery , art karat Jewellery . 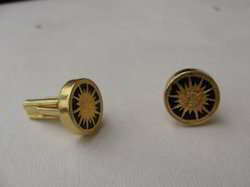 Thus consumers place repeated orders for the traditional Thewa Jewellery we offer at reasonable prices. 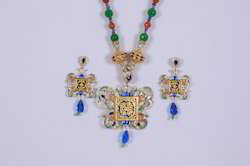 A unique collection of art in Fashionable Thewa Jewellery, where silver is used for kundan designing, each piece of glass is placed on top for protection of silver. 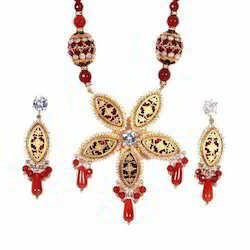 Each kundan is made by skilled craftsman. 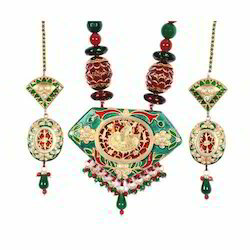 Amazing collection of art in Kundan makes Thewa jewelry more beautiful. This set has 70 kinds made by hand. Durable Thewa Jewelry offered is made available by us under item code JA-I02 and features traditionally designed the jewelry artwork that is beautifully crafted and depicted on the offered pieces. These feature use of bright and rich colored stones that are studded with the jewelry so as to provide the rich, exclusive finishes. Made available in fine cuts and excellent polish support, these comprise unique carvings that further enhance the finish value of these pieces. 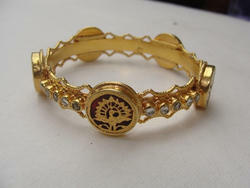 Designer Kada, bangle set in the decorated with silver base kundans in between. 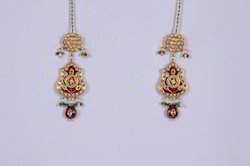 Real Thewa Jewellery offered is made available by us under item code JAI02. 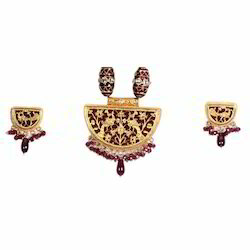 These beautifully crafted as well as the mesmerizing range of jewelry pieced feature an artwork intricate depiction of traditional the artwork that further help in enhancing its overall finish values. Well recognized in the global markets for its authenticity and fine finish, these traditional Jewelry pieces are highly desired in the field of fashion Jewelry. We are also engaged in providing Thewa Jewellery. 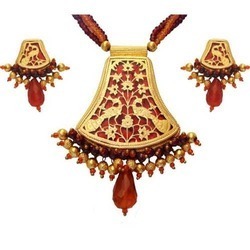 Thewa Necklace Set is designed with 23 Carat gold fusion on the maroon color glass. Thewa jewelry, silver, and the fusion earrings.